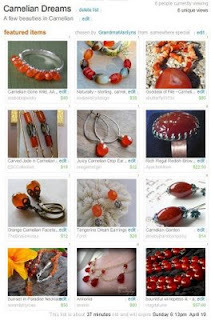 Etsy has a button marked Treasury on its home page. Etsy members hand pick items they like and put together treasuries from them. Then they look for an opportunity to snag an opening to be able to list their treasuries. Each treasury only exists on Etsy for a few days. The treasuries usually have a theme. The items may be made out of similar materials, have similar colors or go with a particular holiday for instance. 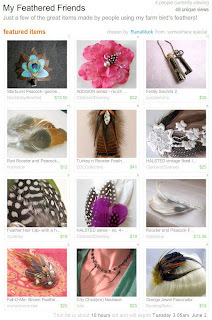 I have added screen shots of the two treasuries that I have been included in so far so that if you missed them on Etsy, you can see them here. I am very happy to have my items in the company of the other listings that were included in these treasuries. A pair of my gathering pins was featured in Carnelian Dreams and a feather wrap pendant was featured in My Feathered Friends. You can click on either photo to see a larger image. Thanks to GrandmaMarlilyns and RanaMuck for including me in their treasuries. Is there a special someone in your life in need of a special gift for her June birthday? If so, consider showing her how special she is by pampering her with pearl jewelry. After all, pearls are the birthstone of all June babies. Pearls can be man-made, cultured or totally made by nature. 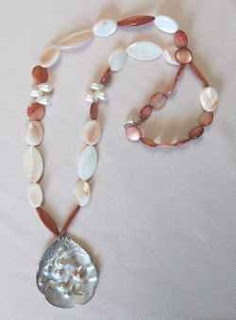 Man-made pearls range from lower quality plastics to higher quality coated glass and shell beads. The process of producing cultured pearls was discovered about 100 years ago. Until this process became more widespread, the only pearls that many people could afford were man-made. Cultured pearls differ from totally nature made only in that a “seed” is intentionally introduced to the oyster (saltwater culture) or mussel (freshwater culture) instead of having the mollusk acquire one by chance in nature. The process of pearl farming has produced a more affordable supply of pearls for everyone. 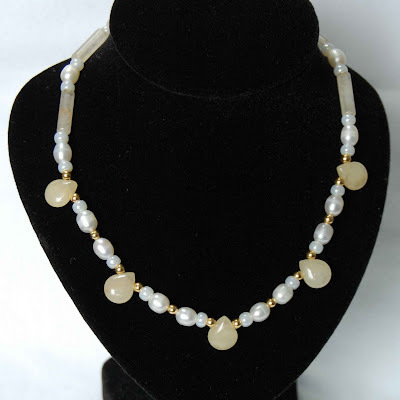 I work with cultured freshwater pearls. I gravitate towards the lovely, undyed colors in white, cream, peach and lavender. 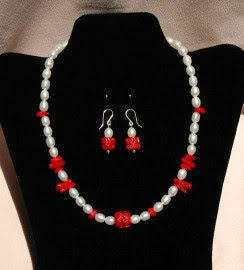 Pearls make a statement on their own or pair well with, crystal, gemstones, coral, metal and glass beads. Find a special gift of pearls for your June birthday girl at edccollective.etsy.com or ask me to create a custom creation for you. With portions of the U.S. having just experienced freeze warnings it probably seems premature to be worrying about getting your garden ready for summer. Many articles are written about getting your garden ready for the winter, however for those of us that live in areas with hot, predominantly dry summers, “summerizing” could be even more important than winterizing your garden. I recommend focusing on three tasks; weeding, planting and mulching. While I will pull a weed anytime of the year, this is an especially good time to do so while there is still some natural moisture in the soil. Getting the entire weed out is easier and the disturbance this causes will be less traumatic to nearby plants. Many weeds have not gone to seed yet, so you will be reducing next season’s weed seed load as well. If your late winter/early spring annuals are getting tired, you should replace them with summer color now. This will give the new plants some time to get established before the heat hits. If your spring annuals still look good, you can get some 4 inch summer color and sneak them in around your existing plants instead of ripping them out. 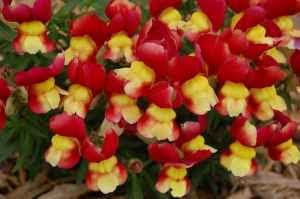 This will give your summer color time to get established and still enjoy your early color until it gives out. Most important in this list, mulch! 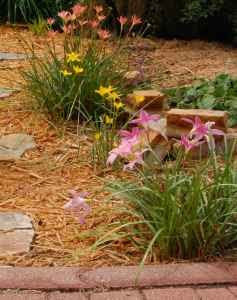 Mulch does a lot for your garden. It helps keep the moisture that we have in our soils from evaporating, reducing the need for supplemental watering. It provides “air conditioning” for your plant’s roots by keeping the soil cooler. It helps control weeds and makes those that do come up easier to pull and it helps improve the texture and composition of your soils. If you attend to these three tasks now, you should enjoy the benefits of a lovely and easily maintained garden all summer long. What’s an Artist’s Time Worth? I’m sure that an artist shouldn’t be asked to work for free. I’m also sure an artist’s time is worth more than what an unskilled high school student earns in his/her first job. Currently the US minimum wage is $6.55 per hour. It is scheduled to go up to $7.25 per hour in July of 2009. While an artist’s rate may vary according to skill and experience level, as well as type of art/product, it is the artist’s time that turns the raw materials into a finished product and compensation for this is only reasonable. I once was told that I shouldn’t charge for my time involved in designing and making my jewelry, that I should only take into consideration what my materials cost. Well, beads don’t assemble themselves into jewelry, just as computers don’t generate the vision that someone has for a logo or a banner without the graphic artist’s skill and considerable investment in software and hardware. There are many people out there that do understand and appreciate the skill that goes into producing custom graphic designs, handmade jewelry, clothing, accessories, pottery, home décor, etc. To these people, I say thank you. To those that haven’t thought about it, please contemplate what you would value your time at. How long does it really take to produce a logo, custom jewelry design or a decorated gourd? Just because someone is self employed, it doesn’t mean that they should be paid substandard wages. It is an insult to the artist to expect something for nothing. Everyone should get a good value for their time and their money. I hope that artists take enough pride in their work to get paid for what they do and charge a reasonable price. I hope that customers see the value that the artist has added to the cost of the materials and not expect to pay just the materials cost or some token amount above that for the finished product. I think long and hard when I am pricing something to make sure that I am getting paid for my time and materials in order to be able to stay in business, while keeping my prices at a point that customers can afford and feel good about. See for yourself, EDCCollective.etsy.com.